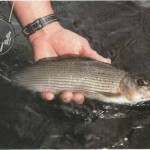 The fast, oxygenated water contains myriad aquatic insects – and big grayling. But be very careful when wading and landing fish. Dennis designed a 9ft (2.7m) fly rod for grayling fishing with the Bob Church Company. His motto: keep tackle simple. 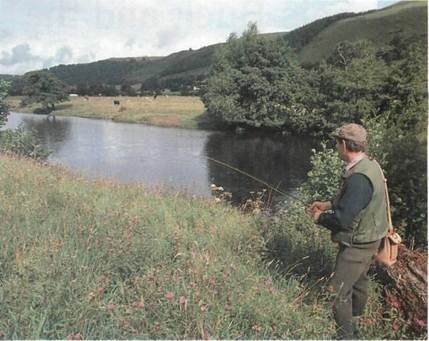 You can’t help but enjoy the Welsh mountains when fishing on the Dee. Dennis surveys the top of the ‘Berwyn Arms’ water for rising fish. A 9ft (2.7m) leader and single size 26 Adams were drafted for mid-river duty. 1. 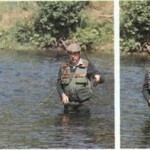 As long as you wade carefully, this method is suited to fishing turbulent water. 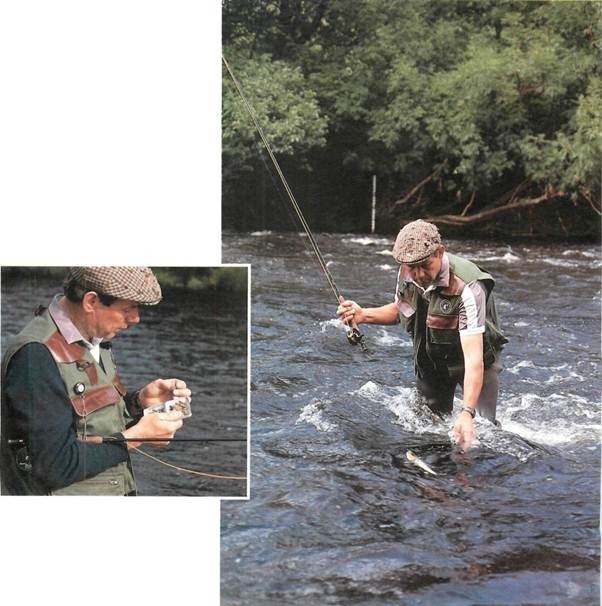 But, says Dennis, ‘You can fish the rolled nymph in slow water with small, imitative nymphs just as well.’ He flicks his flies upstream only a rod’s length out. 2. The leaded flies sink quickly. With the end of the fly line just above the water in a bow shape, Dennis follows them as they roll along the bottom. Any straightening of the bow is met with a simple lift of the rod to set the hook. 3. If the flies become snagged, choose lighter ones or move the rod just a bit faster downstream than the flies are drifting. This lifts them off the bottom. Follow the flies downstream as far as you can. Lift off, take a step, and repeat. 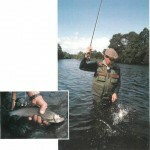 The nymphs used by Polish International game anglers are big – hook sizes 6-8 – and heavy. 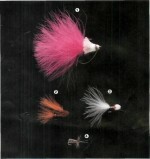 With simple bodies in a variety of different colours, they are designed to delight the eyes of game fish, not anglers. 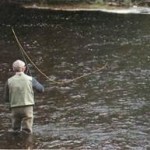 There are many places to fish the Dee for grayling, trout and salmon. In Glyndyfrdwy the Berwyn Arms Hotel (tel 0490 83210) issues single-bank day tickets. By car Starting out from Shrewsbury, follow the A5 north-west. Drive through Llangollen. The Berwyn Arms Hotel, Glyndyfrdwy, which controls this stretch of the Dee, is four miles east, on the right hand side of the road. By train The nearest BR station is in Wrexham, a long trek by minicab. Superb grayling fight all the way to the net – or your hand. Keep the rod up , and don’t rush things. 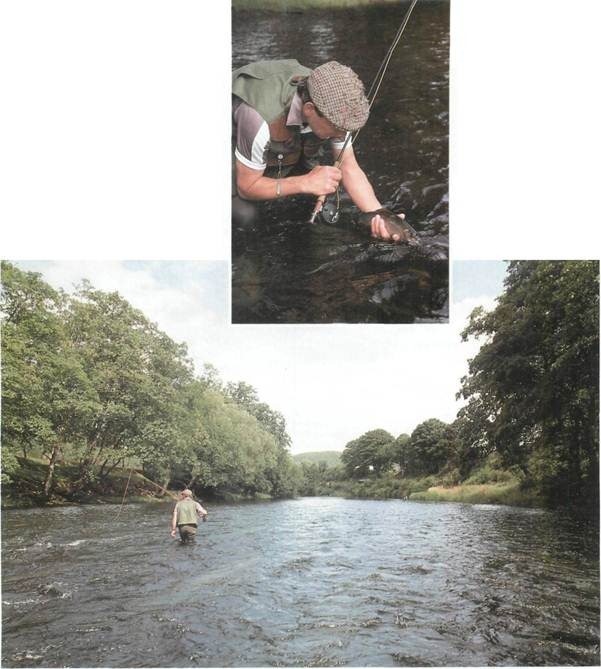 Dennis gets ready to land a grayling near ‘the ledge’ in the Berwyn Pool. 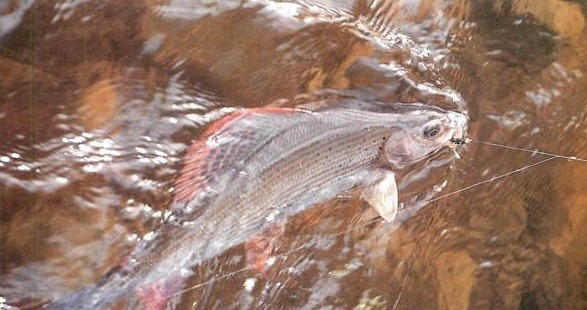 Grayling such as this can only thrive in waters which are clean. They are usually the first species to disappear when pollution -sewage or agricultural runoff- enters a river. 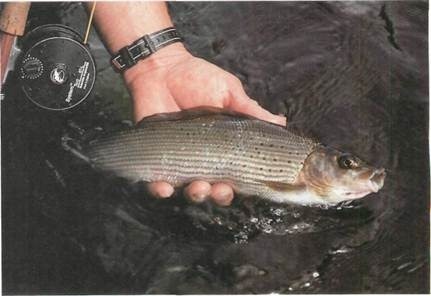 With their overslung top lip grayling are well adapted to bottom feeding. 1. This is a good technique for fishing pools from across the river. 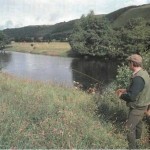 After casting, mend a slight downstream bow or belly near the end of the fly line. Follow the nymphs with the rod as they drift downstream. 2. If the bow suddenly straightens, lift up on the rod. When the flies drift well downstream of the angler, they begin to drag and are pulled up off the bottom. At this point, lift off to recast. The biggest grayling of the day – a fine V/ilb (0.7kg) specimen – hit a leaded Goldhead in the Berwyn Pool. 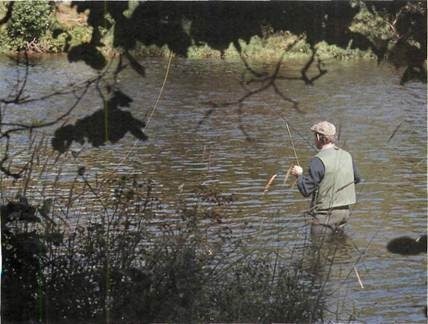 The pundit presents you with a typical scenario: streamer weeds sway rhythmically in the current as grayling puncture the surface of a long glide. Small dark olives twist and turn on the spiralling currents. With a size 18 emerger pattern, he begins — and takes fish after fish with sobering regularity for most of the summer afternoon. Sure he does. Sure. Words can sometimes be a long way from reality. Tread warily on these minefields of information. Don’t accept them without testing them, or you could break your rod over your knee and take up cross-stitching. 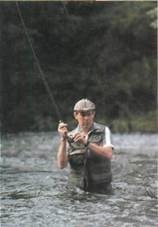 Dennis Buck is under no illusions when it comes to fly fishing. On this bright, warm mid-August morning the big River Dee is high and clear. He knows things aren’t going to be easy. At the top of the Berwyn Arms stretch a few grayling rise indiscriminately and disclose their general presence in mid river, but not with predictable regularity. There are no signs of a hatch underway — but perhaps the fish are rising to midge pupae suspended in the surface film. 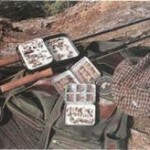 ‘I’m not a person who believes in hundreds of different dry flies,’ says Dennis, pulling out a small tin fly box stuffed with old reliables – Pheasant Tails and Adams to size 26, Grey Wulffs to 20, and Treacle Parkins to 22. He believes grayling (and trout for that matter) in freestone rivers can be fooled easier with small flies than large, bulky ones. Dennis covers the fish — but they don’t take. (Well, there’s no guarantee with any method, outside electro-fishing.) 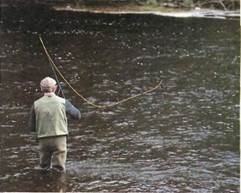 But he sticks with it and farther downstream takes a small ‘Lady’ on a size 26 Adams. After a pub lunch in nearby Corwen, we descend the steep Welsh mountain to the valley. The sun’s out in full force, so Dennis heads straight for the fast, broken water in front of Berwyn Pool, below the hotel, to try the Rolled Nymph technique. It’s best to use a short, two-dropper leader, but this varies with depth. The deeper you fish, the longer your leader needs to be. 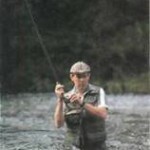 Dennis has the heavier fly — a leaded Goldhead Nymph – on the dropper while a leaded GRHE goes on the point. You can use hook sizes between 10-14, though he prefers Kamasan size 14 extra-long hookshanks for adding a lot of lead and creating the big body essential for imitating large caddis larvae. 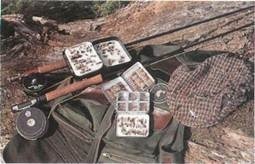 Dennis has found caddis cases up to 2.5cm (lin) long in a few grayling he has killed. Most of the fish in the fast water feed on the stony-cased larvae living in the boulder-strewn, oxygen-rich water and are stuffed with small stones. There are many species (and sizes) of caddis which emerge at different times of the year. Too many anglers emphasize the adult caddis fly imitations during a hatch, not giving the emerging adult its due, even though grayling and trout take the emerger in higher numbers than the adult. Regardless of whether there’s a hatch or not, grayling and trout actively scour the bottom looking for cased caddis. These insects are on the fish’s menu year round. The larvae, far from being stationary, move about the stream bed and even drift downstream and settle again. So the fish hunt for stationary caddis and expect to see them drift past. The Rolled Nymph allows you to copy the drifting caddis. You can present your flies hard along the bottom, see the slightest movement of the line, strike quickly and effectively and cover a lot of the river bed — fast. This is not a technique to try if you enjoy casting, for you keep your flies fishing along the bottom and not in the air. Slowly and carefully, Dennis moves out to mid river above the pool, where the water is fast and deepens towards the bank. It’s difficult to wade and fish effectively, so it doesn’t receive much attention. The turbulent water camouflages Dennis’ approach. About 1.2m (4ft) of fly line extends from his rod tip. The leader set-up is 5ft (1.5m) of double strength 5lb (2.3kg) line with a dropper 2lA ft (75cm) from the point fly. The end of the fly line is just above the water and has a slight bow in it. Because the leader alone is in the water (and not the fly line), its low diameter helps it to cut through the current and allows the flies to hold the river bed where the flow is slower. Dennis watches the bow of fly line for takes. He makes a dozen or so passes, moving towards Berwyn Pool. 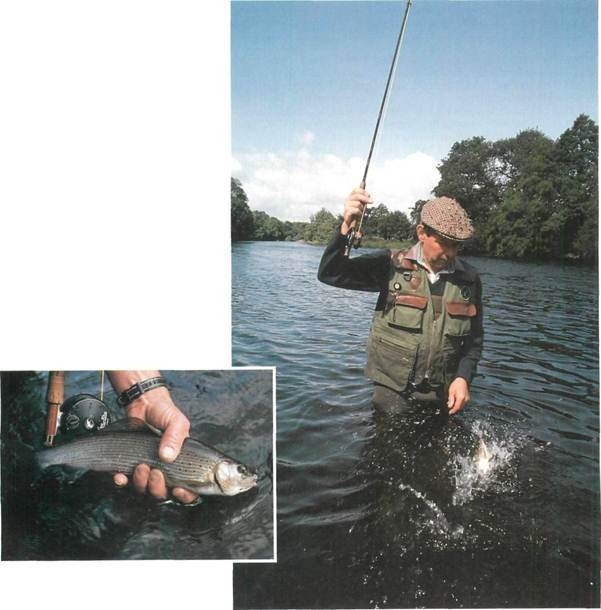 The bow straightens suddenly, and he’s in with a 1lb (0.45kg) grayling. Once it’s up in the current, it bores downstream, making several surface runs before he can land it, remove the hook and release the fish. He makes a pass or two and then takes a step towards the pool. After a few more tries he connects with another grayling — but only momentarily for it shakes the hook. The water deepens to 1.4m (4/4ft), and Dennis stops, explaining that there’s an underwater drop-off or ledge about a rod’s length towards the bank. 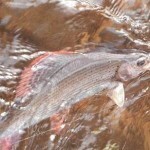 Many grayling lie just under the ledge, out of the current. After just one drift, his rod springs to life as a Valh (0.7kg) grayling stays deep, heading for the slow water of the pool. Bullied up, it cartwheels across the surface a few times before he can land it. Upon release, the steely grey fish bolts down to its rocky lair. Dennis fishes the whole fast-water area, taking three more grayling. With his five weight floater, a short leader (7ft/2m) and two Goldhead Hare’s Ears, Dennis begins in a length of fast water well below Taylor’s Pool – a good grayling stretch year-round. 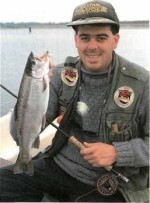 This is a good technique for fishing slow, even-flowing glides and deep pools which you can’t wade easily. It isn’t suited to fast water because forming a bow and seeing it straighten may be difficult. 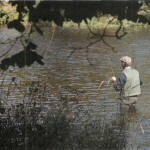 He works his way up to the pool, taking another grayling and a small trout. Dennis adopts a roving approach and patrols the Dee for rising fish. Nothing is moving on top, so he decides to call it a day and head back home early. With many plump grayling to his credit, despite the difficult conditions, he’s well pleased. Many fly fishermen scrutinize his methods and can’t believe they can be so effective – the reality of his techniques is a long way from mere words. for harbouring grown-on trout. The shallow water and gravelly bottom, with patches of prolific weeds, are good insect and crustacean habitat, attracting perch and roach all season. And where there are good stocks of coarse fish… big fish lurk. Tony attaches a Blakeman’s White (like many flies, named after its inventor) to his 20ft (6m) leader of 8lb (3.6kg) feeder line.